DENMARK: Wind developer European Energy has made its first move into the offshore wind sector, acquiring the nine-year-old Sprogø project from owner Sund & Bælt. 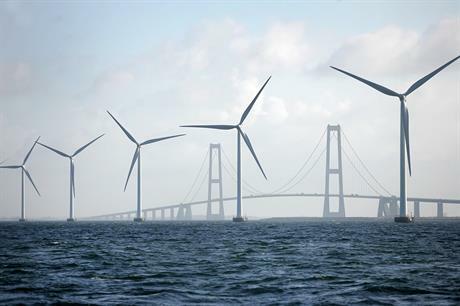 The 21MW project is installed in the Great Belt between Denmark's two major islands, Zealand and Funen. Sund & Bælt own the nearby Great Belt Bridge, making the project one of the most visible in Denmark. The project comprises seven Vestas V90-3MW turbines, installed in water depths of 6-16 metres, and roughly 450 metres apart. It was commissioned in 2009, shortly before the COP15 climate conference in Copenhagen. Sund & Bælt said the project was for sale in September 2017 to focus on its core business of infrastructure and payment management. "The wind farm is an attractive asset and it will provide insights into the operation and maintenance of an offshore wind farm," said European Energy CEO Knud Erik Andersen. The deal is expected to close in June. "We believe that offshore wind has a place in the future energy mix, alongside onshore wind and solar energy. With the acquisition of Sprogø Windpark we have all three elements in our portfolio," Andersen added. According to European Energy, the project has maintained over 97% availability in its lifetime. "Sund & Bælt will continue to purchase green electricity for the operation of our own infrastructure facilities," said Mikkel Hemmingsen, CEO of Sund & Bælt.